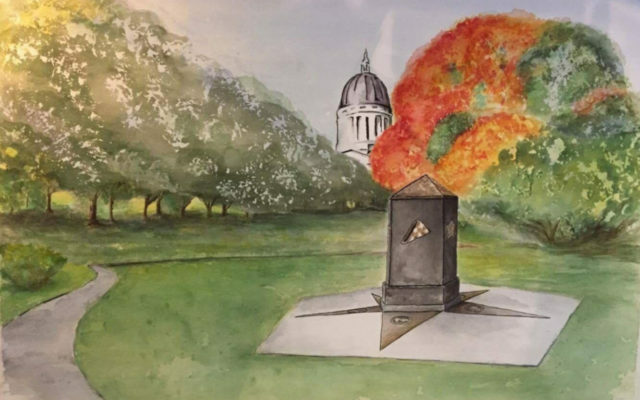 AUGUSTA, Maine — A Maine committee is spearheading fundraising for Maine’s Gold Star Family Memorial. The purpose of the Gold Star Family Memorial is to honor Gold Star Families from all wars and conflicts, preserve the memory of the fallen, and create a lasting memorial for future Gold Star Families through community recognition. On Thursday, Aug. 30, 2018, the 128th Maine Legislature unanimously approved the Maine Gold Star Family Memorial to be located at Capitol Park in Augusta, adjacent to the Vietnam Memorial. Groundbreaking for the Memorial will take place on Saturday, Sept. 22, with a dedication date in 2019. The second side features the Gold Star Service Banner that family members display and being defined as a white field with a red border, with a Gold Star representing a family member who died during service, regardless of cause of death. The third side features emblems of the five branches of service, and the Oath of Enlistment. The fourth side features a quote honoring and remembering those who have made the ultimate sacrifice. The fifth side features the committee’s mission statement and dedication. Atop the Memorial are Gold Stars, one representing each State. At the base of the memorial, a star radiates outward, accented by each branch of service. The area adjacent to the memorial will feature two granite benches, one honoring White Star Families and the other POW/MIA. A flagpole with yardarm will display the American flag, State of Maine flag and Gold Star flag. The Maine committee creating this memorial includes Lorna Harris, Gold Star mother of Army Specialist Dustin Harris; Morgan Winslow; Renee Fournier; Lil Charron; Keith Hinds; and Jonathan Kelley. Planning and fundraising efforts are being launched in the coming weeks. For more information, visit the Maine Gold Star Family Memorial website at https://megsfm.com or find the group on Facebook.